Somewhat to their surprise, the cast and crew and showrunner got their fifth season. But to quote some guy way back in the first, “Nothing’s the same anymore.” Sheridan’s wearing a suit, not a uniform. Ivanova’s gone. There’s a new face in the command center wearing a regulation Earthforce uniform. And then there’s Byron. Welcome to the TNT year of Babylon 5! I’m sort of OK with that by itself. 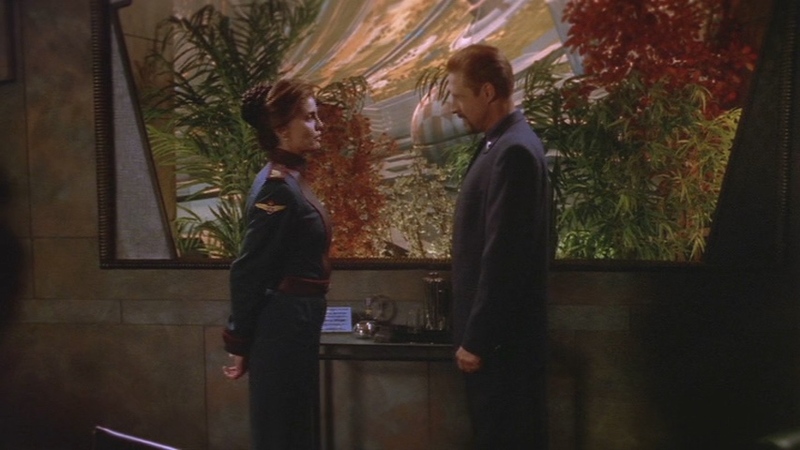 And there is the problem that, after TDoFS, the equation of Sinclair/Sheridan’s struggle with JMS’s struggle to make the show isn’t just a matter of the little joke of insisting that the central character have the initials JMS, so that scene is – among other things – saying that, yes, I am the Great Maker and Babylon 5 doesn’t owe anything significant to other people. And the rest of the episode dresses this up in religious language: faith manages. But that’s a pardonable exaggeration for JMS to entertain for a moment. JMS really was indispensable, and B5 is extraordinary in the degree to which it is his personal creation, in the corporate, co-operative, enterprise that is television production. A brief victory lap is really understandable at the end of S4. But it still means that, after TDoFS, the subtext has become text, and hangs over S5. Everything that happens on the show from this point on can be read as being about the show itself.